Immigration from the Caribbean to the United States is a relatively recent phenomenon, beginning largely after changes to U.S. immigration law in 1965 that placed a new priority on family-based migration. 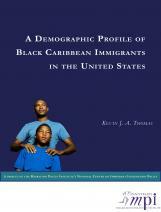 This report, part of MPI's Young Children of Black Immigrants in America research initiative, provides a demographic profile of the 1.7 million Caribbean immigrants in the United States: their geographic settlement, education and workforce characteristics, earnings, modes of entry, family structure, and more. Despite relatively low educational attainment, English-speaking Black Caribbean immigrants earn more in the U.S. labor market than Black African immigrants, who are among the best-educated immigrants in the United States. This earnings gap may be explained in part by the fact that Caribbean immigrants tend to have been in the United States longer and have greater English-language proficiency. The share of Black immigrants varies across Caribbean-origin countries: they are the vast majority of immigrants from Haiti and most other English-speaking countries in the region, 14 percent of immigrants from the Dominican Republic, and just 3 percent from Cuba.